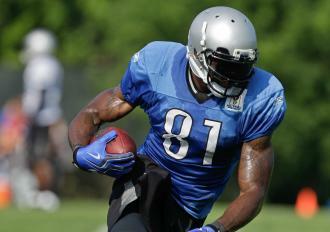 The Detroit Lions gave wide receiver Calvin Johnson a seven-year contract extension worth $132 million on Wednesday. With $60 million of it guaranteed, Johnson, 25, becomes the highest-paid wide receiver in NFL history. The deal will keep Johnson with the Lions through the 2019 season. It trumps the eight-year, $120 million deal the Arizona Cardinals gave wide receiver Larry Fitzgerald last August. Johnson emerged as the league's most feared and dominant wideout as an All-Pro the past two seasons. With Detroit's front office taking care of his contract, he's ready to earn what he will be paid. "What a tremendous blessing this is — not just for me and my family, but my teammates and future teammates to come," Johnson said in press conference. "We're very appreciative, and we're ready to work." Although Johnson, the second overall pick in the 2007 draft, was established as a league-wide star before the 2011 season, his career took the next big step while playing a full, healthy season with quarterback Matt Stafford, the first overall pick in 2009. With Stafford throwing for 5,038 yards and 41 touchdowns, Johnson had career highs of 96 receptions for 1,681 yards and 16 touchdowns. The man nicknamed "Megatron" capped it off with a scary performance in the Lions' wild-card playoff loss to the Saints: 12 catches, 211 yards, two TDs.